'The rat race is for rats and we're not rats.' Jimmy Reid. The following is a quote from a Kenneth Roy article (on what to celebrate in January besides Burns nicht) in the Scottish Review. 'I would start with a Jimmy Reid supper in referendum year. Apart from anything else, Jimmy would have enjoyed a supper in his honour and it's a pity he couldn't be there personally. A Jimmy Reid supper would, for example, include an address to the cigar. 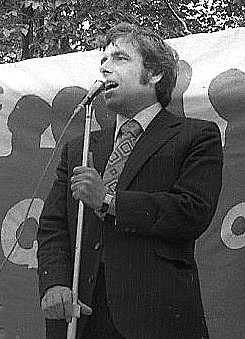 As well as photographing him, I met Jimmy Reid several times in the 70s. I met Tom Nairn as well - at a political gathering in Kings College, Aberdeen in 2001. At the interval I snuck into the loo for a joint. A knuckle rapped on the partition between cubicles and a rasping voice said: "That's a funny smelling cigarette."